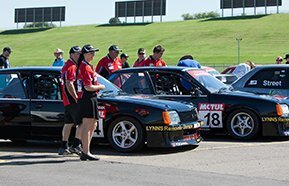 MRTeam enjoyed a successful race debut at the first round of the NSW Motor Race Championship at Eastern Creek Raceway on March 31 & April 1. Drivers and spectators alike were constantly admiring the professional presentation of the vehicles and the team from the moment we arrived to the moment we left. Race officials were also very impressed with both the mechanical expertise and showmanship of the vehicles. One CAMS scrutineer commented "These are well spannered cars!" As you could imagine, we were very pleased with this comment. Qualifying saw Reece take out 14th position while Ryan took out 16th position in a field of 24. Both Ryan & Reece were able to make up some ground on their first race out with Ryan finishing in 10th position with Reece in a close 11th. Ryan & Reece managed to maintain position in the field throughout the second race, however this time it was Reece who finished in 10th place with Ryan close behind in 11th. In their usual style, Ryan & Reece kept family and friends nervously entertained with their brotherly rivalry on the track. Third race out did not prove to be as successful as the previous two. Reece completed the race to finish in 13th position but unfortunately, Ryan was unable to finish the race due to a minor mechanical failure. Full details of race times and results can be found on our results page. All in all it was a great weekend. We had fun and learnt a lot. Plans for improvement include a complete suspension upgrade which will allow us to adjust settings to suit individual circuits and tyre requirements. With the current suspension setup the cars handle really well around a tight circuit like Wakefield Park Raceway as the increased camber allows for greater surface contact on the tyres around the corners. However, a fast circuit like Eastern Creek requires less camber for the tyres we need to run and the angles of the corners. Upgrades will commence early May which will enable us to attend the private practice dates allocated at Eastern Creek during May/early June for development and training, in preparation for the June race meeting at Eastern Creek Raceway. Thank you to our wonderful family, friends and sponsors for your support throughout our debut race meeting. We are honoured we were able to share the experience with you!